Home > Nintendo Wii > Japanese Software > Mahou Sensei Negima!? Neo-Pactio Fight!! «©NCSX»The Negima!? animated series was fraught with magic battles, action, and hilarity. Similarly, Negima!? Neo-Pactio Fight is packed with magic battles, action, and some bits of hilarity. 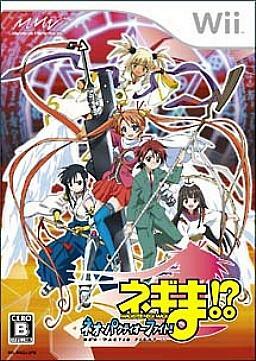 Negima Springfield and the winsome students of class 3-A engage in a 3D fighting game where four combatants duke it out with melee attacks, magic, and partners. A cast of 10 main characters and 30 partners are featured in the game including the pudgy agent animals named Motsu and Shichimi. Please note that Japanese Wii games cannot be played on USA Wii consoles due to the region lockout implemented by Nintendo. To play Japanese or European Wii games on a USA Wii console, you will need a Freeloader boot disc and your firmware must be version 3.2U or lower. This document is ©NCSX 2007, 2009. All rights reserved. No reproduction in whole or in part of this document may be made without express written consent of National Console Support, Inc.